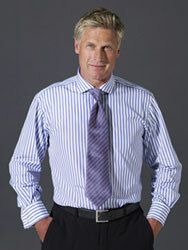 Navy and black are both common suit colours but what happens when you team them together into a striped shirt? You get an elegant and versatile shirt that can be worn for a range of formal or smart casual occasions, just how you like it. 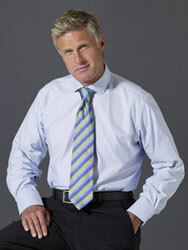 Our 100% cotton poplin shirts are always a popular choice. That’s because they’re lightweight, breathable and so very versatile they really can be worn from dawn to dusk. We don’t think it’ll be long before this shirt becomes a firm favourite in your shirt collection. Just to make things even better, we offer a bespoke hand tailoring service so you can have the shirt customised to your preferences. Simply select your preferences using the menus above, and don’t hesitate to get in touch if you want to discuss your requirements in more detail.